These spooky Halloween decorations are ghostly outlines made from chicken wire. 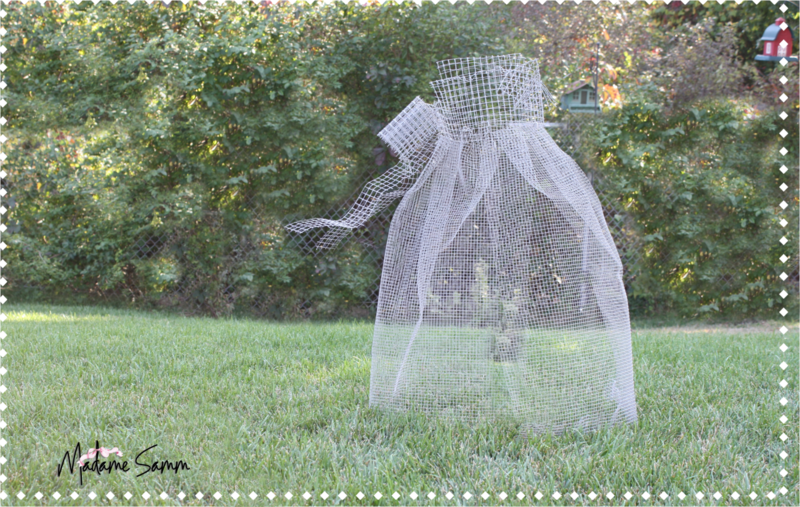 These chicken wire ghosts have become my all time favorite Halloween decoration idea. 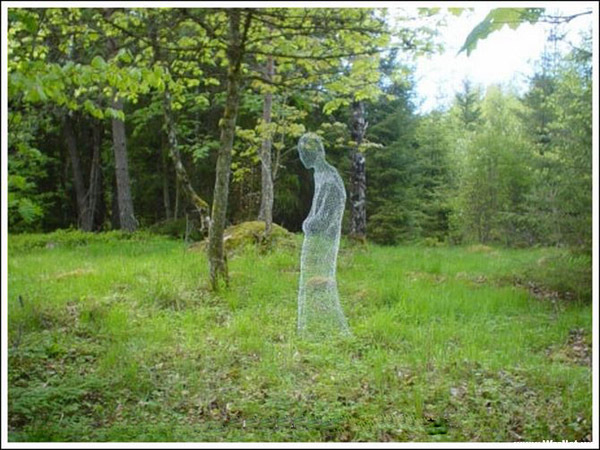 When I first saw this image of a chicken wire ghost I thought it was Photoshoped. It didn't help that it is one of those Pinterest posts where there is no actual source. Just a pin of a pin of a pin. 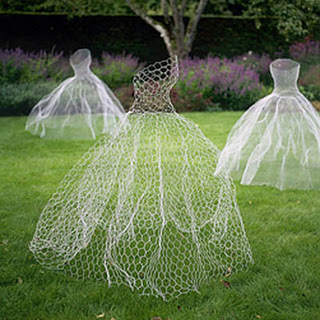 So I did a little searching and I found these fabulous chicken wire dresses. But still no source. But by this time I was IN LOVE with the idea. So I kept digging and found the original tutorial on how to make a chicken wire ghost over at Wacky Archives and then I found this chicken wire ghost dress tutorial over at Sew I Quilt. I think the combination of the two will help you make whatever scary ghost figure in your yard that you could wish for. I have to say that these are so cool they actually give me the heebie jeebies a little! Which only makes me want them more! Wow, those are seriously awesome and creepy at the same time. I definitely want to try this. Thanks so much for your research and sharing it! These are so cool! Love it! I have a friend that found this on Pinterest and started working on some the next day, cool idea! oooh! I thought the same thing of (oh- that is not possible!) Thanks for doing the detective work! I totally love this, I saw it yesterday and today, I made Jessica. She's my new chicken wire ghost friend. I think I'll just pose her randomly around the house after Halloween. You can't even tell she's standing there until you're close! What an awesome idea, thanks!! How can I share pics?? This is so incredibly creative! I shared it on my FB page and Twitter today, linking to this post! :) My kids are begging me to do this ! Oh wow! I will make these this year! Darn! The tutorial of the dresses is gone. Did anyone by any chance save it and can send it to me? I would love to make these but the original tutorial is no longer there. Did anyone save these and could email them to me? I have to make these! I'm so in love with them that this is my new project for next weekend :) thanks for posting. Question...which glow in the dark paint did you use and how long does it glow? That's the part I call into question....does the paint really work as you would expect for these to show up in the yard at night? The "glow in the dark" rocks and containers seem to be a bit of a flop, at least for those who reviewed the Rustoleum product on Amazon. But, do any of you know from your experience? Thanks. If one does manage to accomplish making the dress form, does the glow in the dark paint really work as desired? I read that the "glow in the dark" pathways and flowerpots, etc, that are painted with the widely available glow in dark spray paint...don't really work! In fact, the pathway on pinterest was photoshopped. So, does anyone know if the paint part really works? If so, which product? Thank you so much for researching this! I've been looking myself and happily stumbled across your post. I'm excited about trying this for Halloween. Spoooooky! How do you keep them from blowing away? You can secure them to the ground with I shaped tent stakes if necessary.